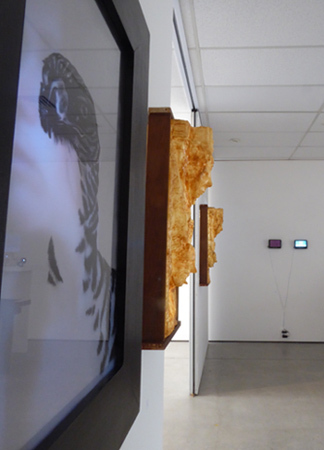 “Re:configuring” by Whangārei-based artists, Sarah Kippenberger and Chris Schreuder in the artist run The Shutter Room gallery and studio space, makes the aesthetic experience mutable and participatory. 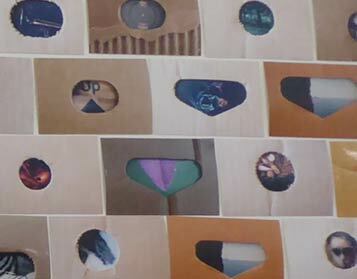 Detail of over 80 images on one of the walls. 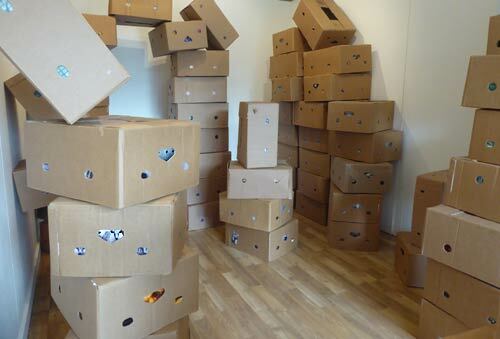 You are instructed to choose an image and then to find it peeping out of one of the orfices of the stacks of 80 or more banana boxes in the gallery space. The title of the show refers to the continually changing configurations created by the visitors. While the photographic images by the artists showing snippits of their lives are framed to be looked at, pondered over or recognized, the frames obscure more than they reveal and the installation of nooks and crannies and towers is not only random but temporary. 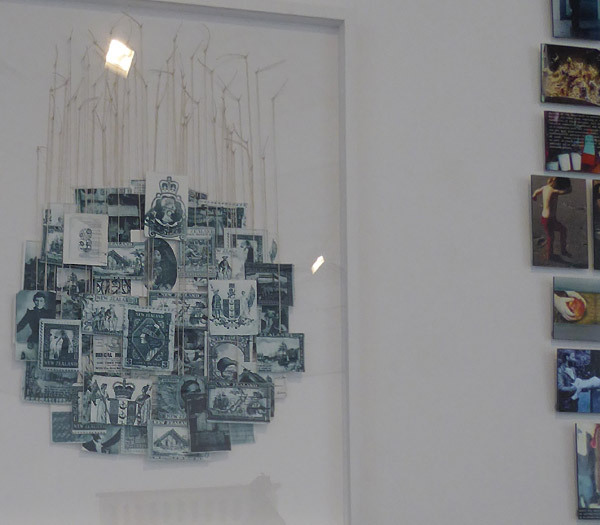 By removing both frame and label this project blurs authorship which often in the art world is an important part of the artwork’s value or reception. 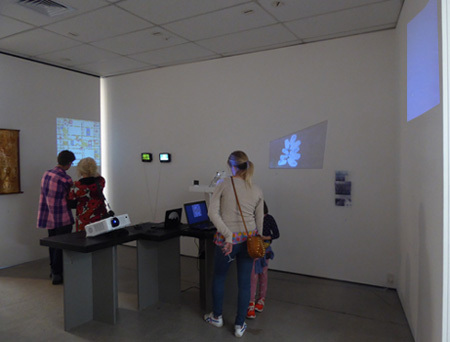 Visitors place and re-position the boxes and so affect the way the images or the boxes are read by the participants themselves as well as later visitor-participants. 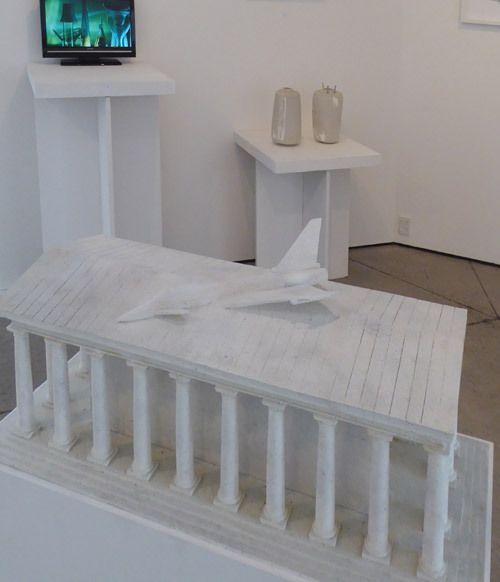 Not only the medium is blurred (installation, performance or an opportunity to rearrange) but also the usual separation between the art object and the gallery visitor. 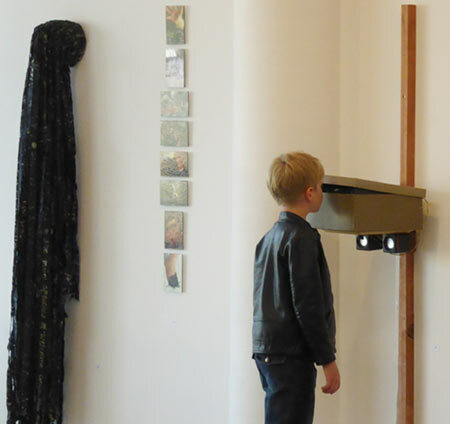 The risk is that the next visitor, expecting their art gallery experience to be about reading a static arrangement, sees nothing resembling ‘art.’ But like many social practice art projects which blur the borders between life and art, a clear context – here in the form of instructions to find the image – helps the viewer to step inside the magic circle and once engaged in the game there’s space for contemplation. The banana box itself is a migrant entering the country on the back of trade as well as being the ubiquitous storage system. But I am being too serious, because this exhibition oozes with joy and lightheartedness. The images are light or delicate with not a trace of angst and none of the boxes are overly battered. There is an out of the box sense of exploration and play that blurs the lines of “object making, performance, political activism, community organizing, environmentalism and investigative journalism, creating a deeply participatory art”  experience. In another sense the box functions as an enabler of alterity (to reference Spivak whose 1997 Documenta lecture made a huge impact on me), a way of exhibiting the photographic in a divergent space – from the inside of the migrant banana box, with whatever baggage it might have that distinguishes it from a gallery wall. Left to Right: “HearSay,” soundpiece, 2018, recording of a generated audio work, by Jonathan Reus. Two paintings by Roger Morris. 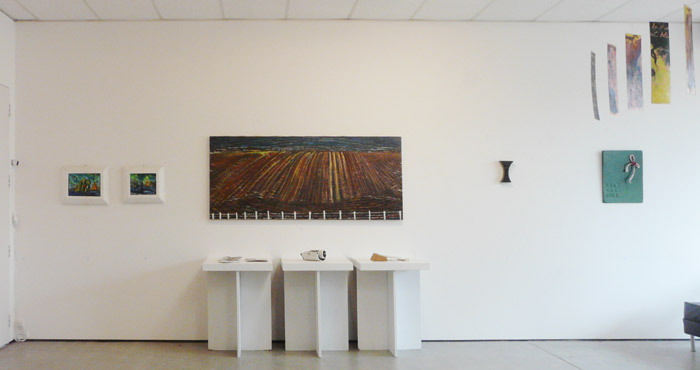 “Trope,” 2018, oil on canvas, 190 x 75 cm by Raewyn Turner and ceramic works by Jess Paraone. 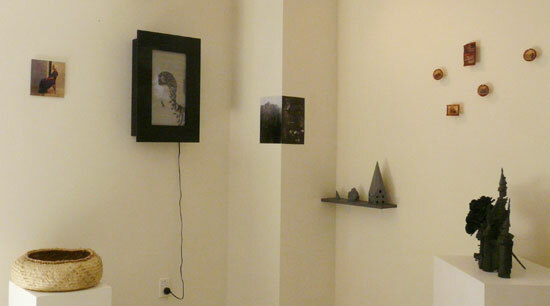 Two small works by Sonja van Kerkhoff. “Pandora’s Box” 5 piece suspended double side painting by Alexis Hunter. “Enduring Freedom” and “‘Axis’ ONE” Oils on board by Roger Morris. “HearSay,” was created by an algorithm which recombined recordings of news broadcasts from CNN, MSNBC and the BBC of an underground slave trade emerging in Libya as reported by CNN in October 2017. The story of the slave trade in Libya was reported through rumors and collections of stories by migrants stranded in local detention camps. This work highlights the problem of news organisations presenting images of truth when these are based on fragmented and subjective testimony. “Trope,” 2018, oil on canvas, 190 x 75 cm, by Raewyn Turner. 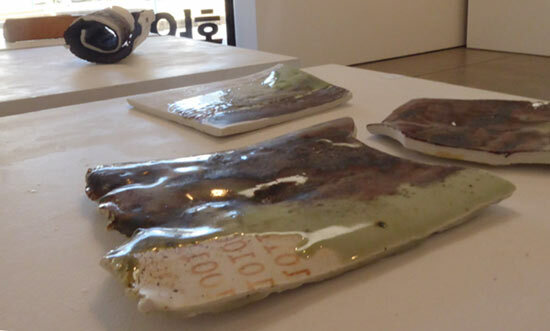 Ceramic works by Jess Paraone. 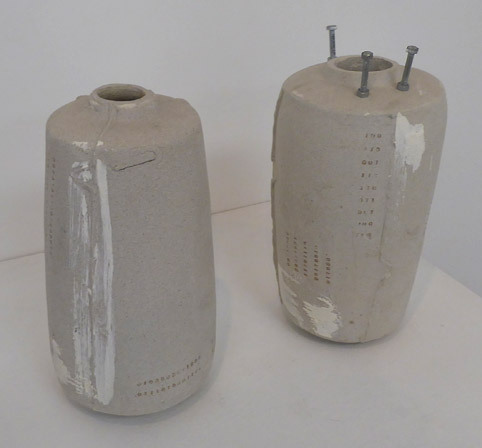 “Binary investigations,” 2 piece glazed ceramic, “Binary investigations,” glazed ceramic, “Liminal,” ceramic, “Binary with foundation,” partially glazed ceramic by Jess Paraone (Ngāti Kawau, Kaitangata). The rows of zeros and ones stamped into the slab-like “Binary series” works by Jess Paraone (Ngāti Kawau, Kaitangata) play off against expressionistic abstract colours and glazes. These numbers can be read simultaneously as abstract element and as symbol for the human or mark of the human made machine. The central piece, from the “Liminal” series is a rolled slab of black dyed raku clay and porcelain clay – materials with very different properties. The contrasting materiality (rough vs smooth, brittle vs elastic) and colours invite multiple readings on the theme of oppositions, compatibility, and diversity. “Liminal,” slip cast porcelain slab + raku clay coloured with black stain, fired to 1260 degrees celcius, “Binary with foundation,” glazed porcelain and brick by Jess Paraone. Click for a larger view. 2 video loops by Pieterje van Splunter. “Vaat” (Washing Up) 2014, stop motion animation, 7 minutes, 11 seconds, and “Cleaning the Air,” 2014, video, 43 seconds by Pieterje van Splunter, The Hague. 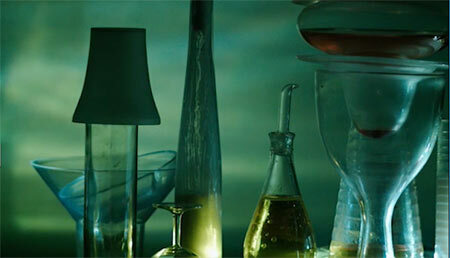 “Cleaning the Air” is a film of a sculpture by Pietertje which rotated diverse household items. “Tomorrow will never be the same” interactive work by Jian Yiwei and Sonja van Kerkhoff, 2 video loops by Pieterje van Splunter. “Tomorrow will never be the same” interactive work by Jian Yiwei and Sonja van Kerkhoff[/caption] When you click on the Mondrian painting the pixel the mouse touches switches colours with another colour in the painting and then creates ‘children’ who land at random, where the same colour swap happens and more ‘children’ are created that swap colours. The affect is that the painting continuously mutates as if it is being eaten by colours. The order (straight lines) created by Mondrian is decomposed by randomness initiated by you. 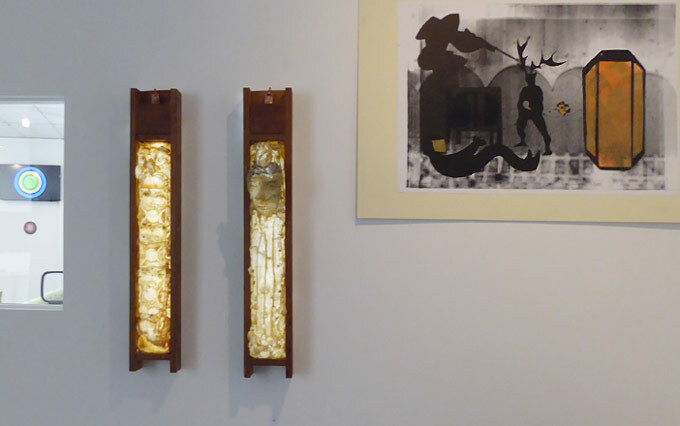 “Outer mantel 3 + 4” (on each side of the open wall), Layers of latex, LED lighting + recycled NZ pine, by Yair Callender. The wooden support was built to instructions given by Yair which included reusing old wood. 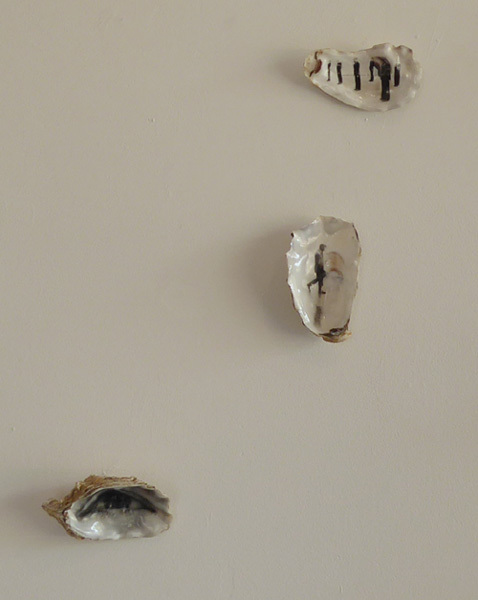 Detail in the back gallery of drawings by Marianne Muggeridge. Yair Callender, born in Groningen (1987) to a Dutch mother and a father who came from Suriname (South America) to the Netherlands to study in the early 1970s, is a graduate of the Hague Royal College of Arts (2014). 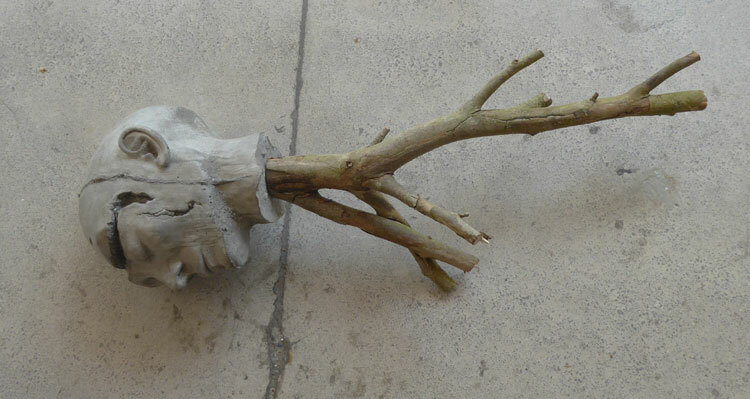 He works in concrete, plaster, clay and wood and his main focus is on making public sculpture. 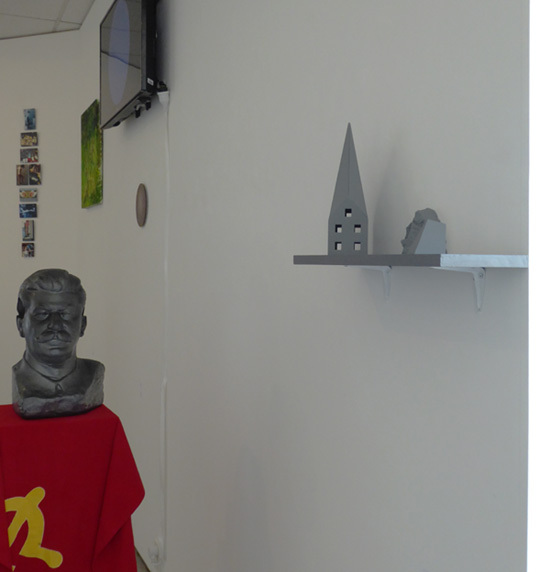 Often his sculpture has some performative social element that involves the local community. His major themes are cultural expressions and art in society in relation to playing with the idea of beauty in the ugly. 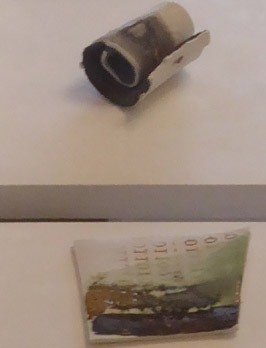 The two larger pieces, layers of resin which are back-lit, were made for this exhibition. These four pieces are playful interpretations of diverse religious symbols (Catholic gargoyles, Asian temples, the Kabbalah tree, etc) found on the exterior of buildings. He has made skins which are lit from within as a metaphor for our human condition – the beautiful seen through the rough and raw. Who could say art is ever ugly? 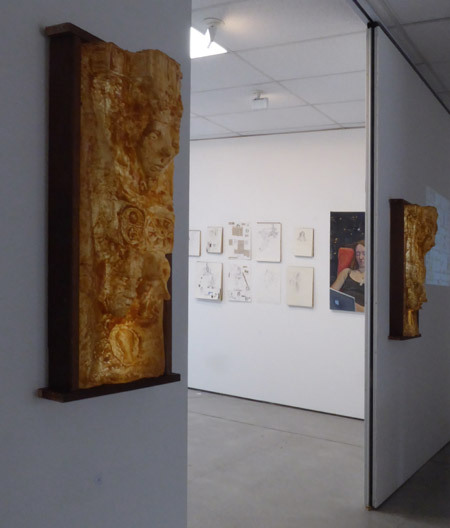 Back gallery: “Your Honour” + “Eva was hier” (Eve was here) by Sonja van Kerkhoff, “Pandora’s Box” suspended panels by Alexis Hunter. “Bird of Prey” video, HD, loop 0’25” photocopy on transparent paper. 21″ LCD tv inside custom-made frame, 61 x 40, Edition of 3. “Outer mantel 3” latex, LED lighting + recycled NZ pine, by Yair Callender. “Bird of Prey” by Sanne Maes is from the morphological studies which concentrate on aspects of the outward appearance of humans and animals. 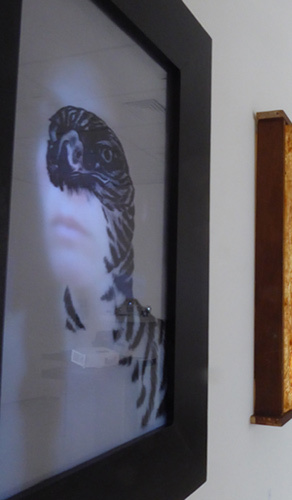 In these works distant species are blended and so create transformations of identity. Detail: “Bird of Prey” video by Sanne Maes. The woman slowly turns her head away and then when she looks ahead her eyes match that of the hawk. Videos by Channa Boon (The Hague), by Jonathan Reus + Sissel Marie Tonn (The Hague), and by Raewyn Turner and Brian Harris (Auckland). Four etchings by Virgina Guy (Hikurangi, Northland). 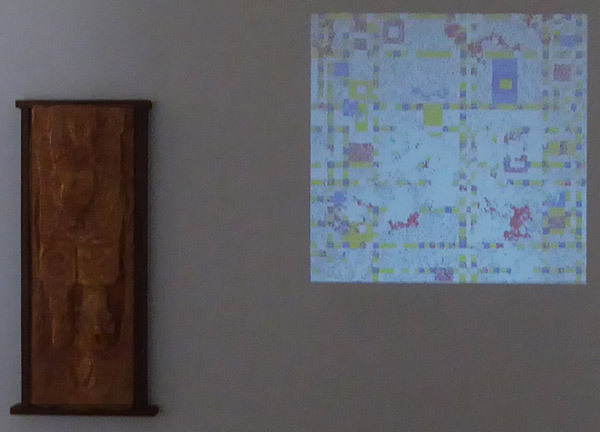 Side wall: Monoprint by Roger Morris (Taranaki), video by Sanne Maes (The Hague) and back lit latex relief by Yair Callender. The latex boxes by Yair Callender on the left light up when approached. Monoprint by Roger Morris. Suspended sheet metal and lamp by Sonja van Kerkhoff. 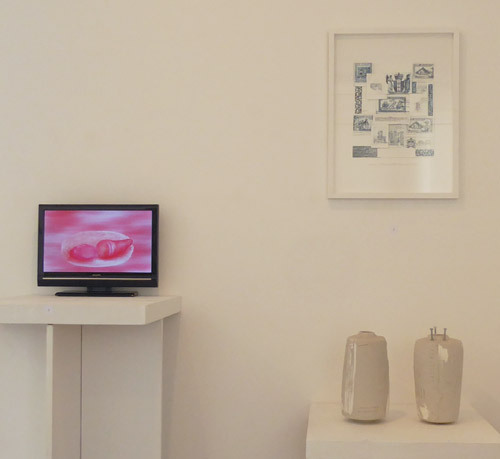 Videos by Channa Boon, by Jonathan Reus + Sissel Marie Tonn, and by Raewyn Turner and Brian Harris. Four etchings by Virgina Guy. 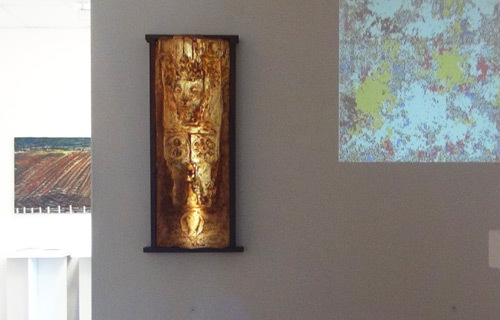 Middle Gallery: “Outer Mantel 1 + 2” responsive light latex light boxes by Yair Callender. “Road to JerUSAlem,” monoprint on paper by Roger Morris. Responsive light latex light boxes by Yair Callender. Monoprint on paper by Roger Morris. “Fain would they put out God’s light,” cut out text sheet steel, nylon and lamp by Sonja van Kerkhoff. “Et in Arcadia ego” 29 min video by Channa Boon, “Sensory Cartographies,” 7 min video by Jonathan Reus + Sissel Marie Tonn. “Finding Flight,” photo intaglio with gold leaf by Virginia Guy. 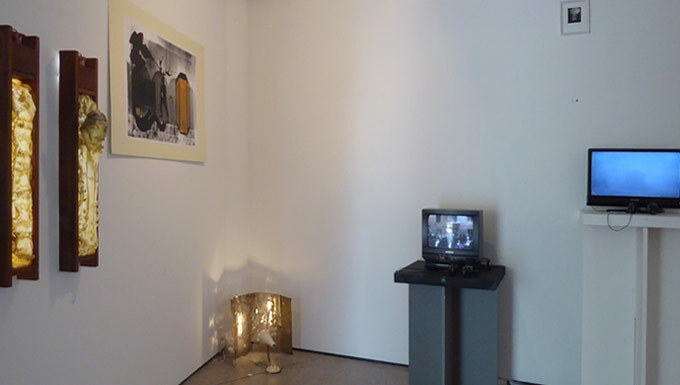 Left: “Et in Arcadia ego,” 2016, 29 minute video by Channa Boon. Joseph Stalin once expressed his view on art and cinema stating: “Propaganda is the strongest and most important weapon of our party and our battle, and in this battle the visual arts are the infantry while the cinema is the air force.” This was one of the inspirations for the video, “Et in Arcadia ego” by Channa Boon, shot in the former Soviet Union. While historical events are the carrier of the film, a chess game, played by two residents of Odessa, sitting near the city’s Arcadia Beach, is the physical link connecting the different locations: the Aral Sea (Uzbekhistan), Odessa (Ukraine) and Tbilisi (Georgia). This film ends when the chess game is over, but the large-scale power game that is still being played out in the former U.S.S.R. is not over. Stalin’s cotton industries for example, founded by him in Central Asia, are still the reason why large parts of the Aral Sea are gone and the entire region is polluted. 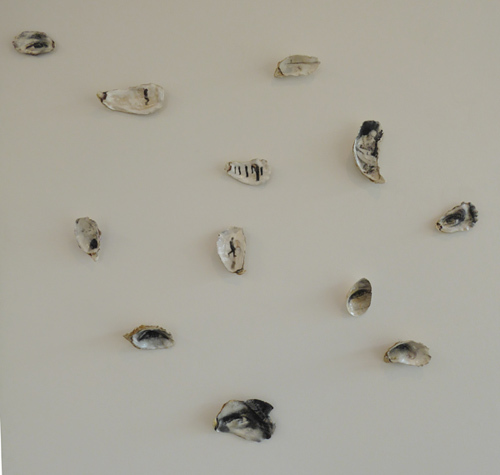 In this work, Boon investigates the idea of ‘location’ as a ‘carrier of information’, which any individual or being can tap into, just by being present at a given spot. Conversely, the film aims to show the system of thoughts and ideas that, throughout history, has created both the physical landscape and those who live in it; how it has affected the way they think and act; and how a collective consciousness has been formed in the past and is still being formed in the present. The phrase ‘Et in Arcadia Ego’ is from a text by Virgil, and is the title of a famous painting (1638) by Nicolas Poussin. The phrase refers to the ideal world that Communism aimed to bring about in this region and the nostalgia that it still invokes. 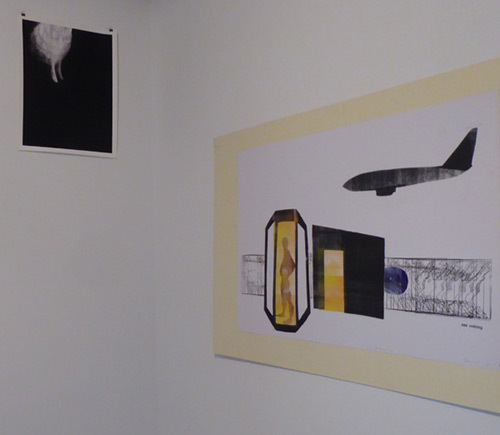 Above: two etchings by Virginia Guy. “Et in Arcadia ego” 29 min video by Channa Boon. “Sensory Cartographies,” 7 min video by Jonathan Reus + Sissel Marie Tonn. “Fallible,” 3 min video by Raewyn Turner and Brian Harris. “Finding Flight,” photo Intaglio with gold leaf. Edition 1/1, 33 x 33 cm by Virginia Guy. “Sensory Cartographies,” 7 min video by Jonathan Reus + Sissel Marie Tonn. “Fallible,” 3 min video by Raewyn Turner and Brian Harris. 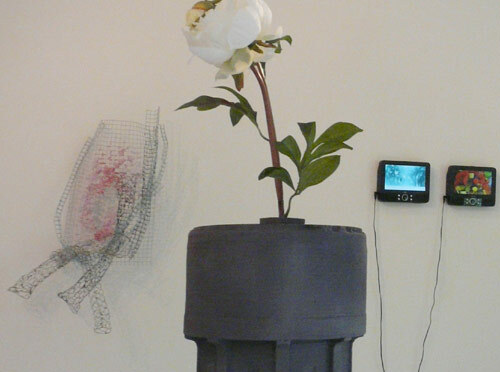 Unscented flowers rotate above a vase which holds a sensor and the data from the sensor is turned into piano notes. 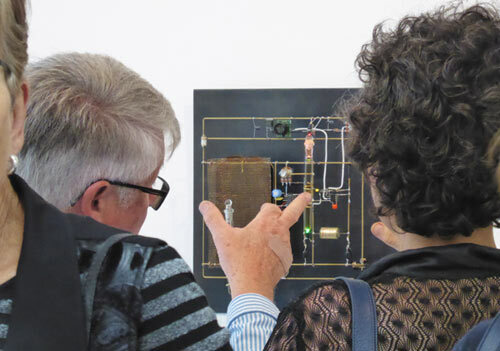 Raewyn Turner & Brian Harris combine art, engineering, science research and their skills developed over years of practice in theatre, the film industry, robotics, interactive software, video, olfactory, art installations and performances. 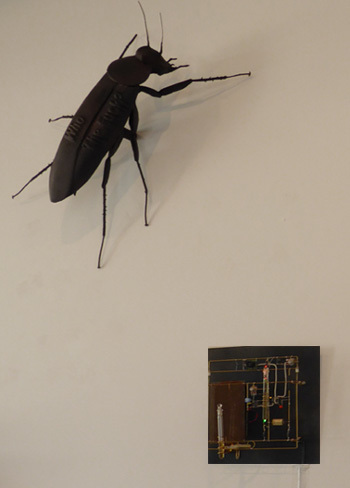 They engage simple elements with engineering to create experiential art, utilising everyday objects reinterpreted with robotics, electronics and microprocessors. “Bird of Prey” video in custom frame by Sanne Maes. Back wall: 4 etchings on paper by Virginia Guy. “Finding Flight,” photo intaglio Edition 1/1, 75 suspended prints, 84 x 118 cm by Virginia Guy. “Finding Flight,” photo intaglio on rag paper. Edition 1/10, 23 x 28 cm. “See Nothing,” monoprint on paper. 2017, by Roger Morris [R E M O]. “Outer Mantle 3,” latex, LED lighting + recycled NZ pine, 2018, by Yair Callender. “Tomorrow will never be the same,” interactive projection by Jian Yiwei + Sonja van Kerkhoff. Two videos by Pietertje van Splunter. “A Meditation,” 7 min video loop by Sonja van Kerkhoff. “Several Seas,” laser print on transparency by Sonja van Kerkhoff. “The Experience of Change,” interactive projection by Jian Yiwei + Sonja van Kerkhoff. “Once our World had Edges” 2017, 3 min, 22 sec., HD video using only NASA International Space Station footage. Music: ‘a distant backdrop’ by sink \ sink, on the album ‘a lone cloudburst’ by Gareth Schott. “Several Seas,” laser print, edition of 50, by Sonja van Kerkhoff. 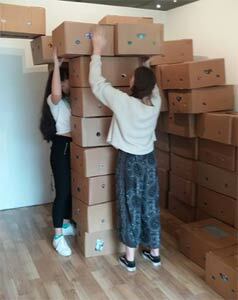 Met dank aan Stroom Den Haag / with thanks to STROOM The Hague for finanicial assistance as well as to NorthArt. 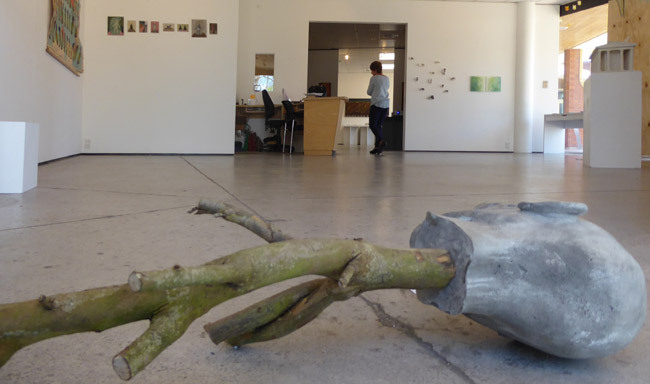 artists from The Hague and Aotearoa | New Zealand. Still from “Een Rode Citroen” (A red lemon), 9 minute 53 second animation. Still from “Een Rode Citroen” (A red lemon) by Anne Wellmer. 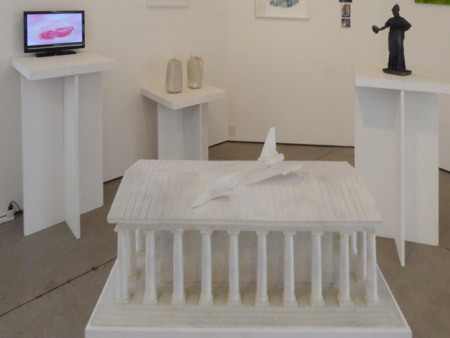 3D plastic prints by Brit Bunkley. Video and soundtrack by Anne Wellmer. Camera: Florian Cramer. Voice: Cora Schmeiser. Music: “O rubor sanguinis” by Hildegard of Bingen. Trumpet: Heimo Wallner. Silent performer and stage design: Geerten Ten Bosch. Soundtrack: Anne Wellmer. Hands: Geerten Ten Bosch, Voice: Cora Schmeiser. Music fragment from BLAST (2015) by Lukas Simonis. Text fragment from ‘Della Religione Christiana’ by Marsilio Ficino (1433-1499), first published in Italian in 1568. This German translation was published in ‘Das Blut: Symbolik und Magie’ (2004) by Piero Camporesi. The text tells of how witches used the blood of children to make medicine and the various uses (transfusions or transmutations) of this medicine, including the making of wine. 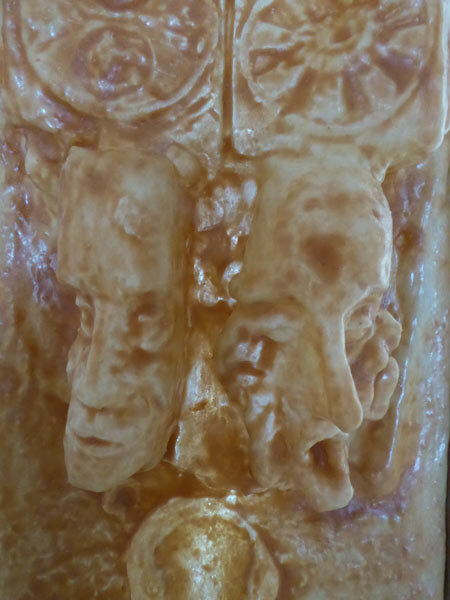 Detail: “Rejoice” 3D plastic print by Brit Bunkley. “Hamlet” 3D plastic print by Brit Bunkley. “Apple Tree” oil on linen by Marianne Muggeridge (Taranaki). “Hamlet” 3D plastic print by Brit Bunkley. 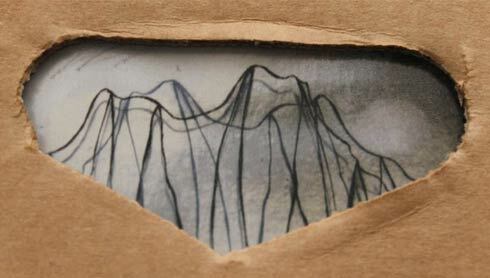 Detail: print by Virginia Guy. One of a number self-portrait explorations on the inner and outer in relation to the natural world. “Take My Shoes” by Raewyn Turner and Brian Harris, shoebox, electronics and video. The voice of a retired police officier plays when someone looks into the box. 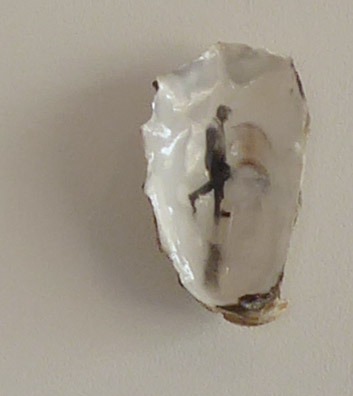 Detail of “Take My Shoes” by Raewyn Turner and Brian Harris showing a video, reflections of this in mirrors and figurines. “Ungeziefer 2” ASB plastic and paint, by Brit Bunkley. “Ungeziefer 2” ASB plastic and paint, by Brit Bunkley. Ungeziefer (vermin, pest or unclean) refers to the main character in Kafka’s novel, The Metamorphosis (Die Verwandlung), in which a salesman awakes to find that he has metamorphosed into a monstrous vermin (“ungeheures Ungeziefer”). When the work is approached to sample the sweet perfume sealed in the flask, the electronic circuitry emits a second earthy organic odour. A map hung in many New Zealand primary schools in the 50-70s printed by the British company, George Philip & Sons, showing the British Empire (in pink), other colonial powers & British shipping lines as they were in the late 1940s. Acrylic on hardboard votive like paintings by Pietertje van Splunter. Foreground, “Metamorphosis IV” by Sanne Maes. 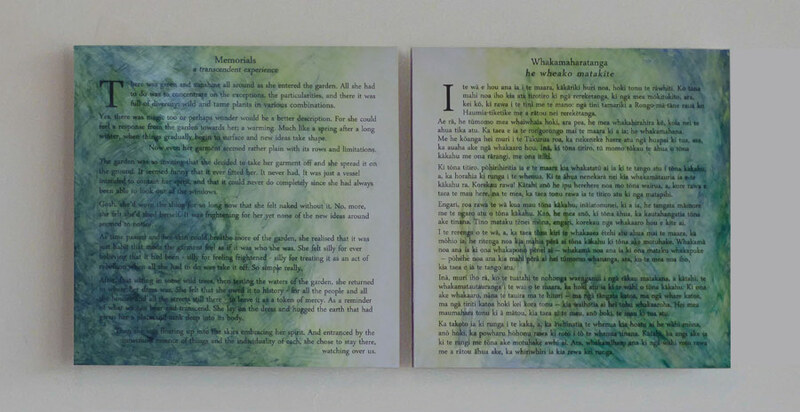 Te Maharatanga | The Recollection, oils on dubond, diptych by Sonja van Kerkhoff. Each piece is 30 x 30 cm. Edition of 38. The fairytale takes a feminine point of view where the garden is a gateway for transcending social conditioning. Translation: Te Toroa Pohatu (Ngāti Apa). Front row: Ode to the cessation of bleeding by Lesley Anne Morgan (Te Awamutu), Alternative Activities for the Addicted by Elaine Arkell (London), Love Me Knots (with twists) by Sonja van Kerkhoff (The Hague), Elephants for Peace by Elaine Arkell, T-Shirt Plastic by Maureen Baker (Whangarei Heads), Out of Sequins by Brian Harris (Auckland), De-composition (with biogradable rubberbands) by Sonja van Kerkhoff. Elaine Arkell (London, U.K.) | Maureen Baker (Whangarei Heads) | Hamish Oakley-Browne (Whangarei) | Susan Burgess (Christchurch) | Megan Corbett (Hikurangi) | Virginia Guy (Hikurangi) | Brian Harris (Auckland) | Dulcie Hering (Hikurangi) | Sen McGlinn (Kawakawa) | Lesley Anne Morgan (Te Awamutu) | Julia Newland (Whangarei Heads) | Benjamin Pittman (Hikurangi) | Lisa Ponweiser + Mt Hutt College students (Methven) | Jason Ratahi (Opunake) | Jacob Squire (Hikurangi) | Ursula Safar (Wales) | Te Kowhai Trust (Whangarei) | John Thomson (Hampshire, U.K.) | Raewyn Turner (Auckland) | Sonja van Kerkhoff (The Hague, The Netherlands) | Jacqueline Wassen (Maastricht, The Netherlands). T-shirts by Lesley Anne Morgan + Elaine Arkell. The design for her shirt which features an original 1960s spirogragh drawing made as an ‘alternative activity’ for smoking and the T-shirt was created for the “Your Art Here (too)” on Camberwell Green, South London for Daniel Lehan’s Camberwell arts Week event in 2010. This T-shirt series also had an outing to Brighton with David Medella and the artists of the London Biennale for the project, Longshore Drift. The pink T-shirt, Love Me Knots (with twists) by Sonja van Kerkhoff is a play on materiality and sentiment with the row of rosebud knots at gut level. Tīmatanga Kaitiaki (Protected or guided beginning, start or intro) by Jason Ratahi. A T-shirt of slogans in Māori and New Zealand English, Red by Sonja van Kerkhoff, a padded and filled T Shirt. Rabbits by Dulcie Hering. The light blue Tao Shirt by Susan Burgess has the symbol cut. 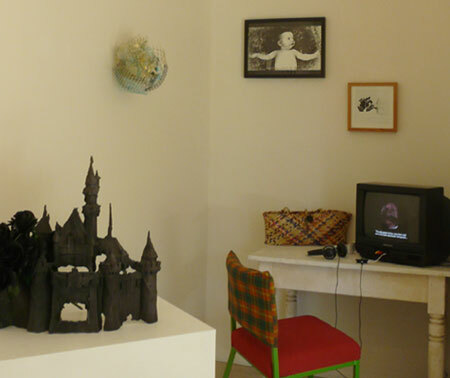 The black shirt at the end of the next row is ‘seed, crop, harvest’ from the album CLAY CLASS DFA Records New York, 2012 by John Thomson, who wrote “My kinetic sculptures feature in the music videos of the U.K. band, Prinzhorn Dance School.” Next is ‘I begin I end’ What I do in between is up to me, a unique symbol screenprint by Megan Corbett while Rabbit by Dulcie Hering is a printed design sewn onto a T-Shirt. Details of T-shirts by Susan Burgess + Raewyn Turner. 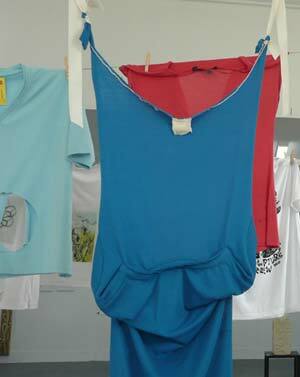 Apron with anti-spasmodic, anti-arthritic, anti-rheumatic galbanum by Raewyn Turner is a blue T-shirt that was cut and resewn into the form of an apron with cloth sachet of perfume. In constrast to Raewyn’s repurposing of the T-shirt, Forget Us Not is purpose-made by Ursula + Alison for their rural gardening business which cares for the gardens of the oft ‘forgotten’ in our society: the elderly. Nearly everyone has worn a T-shirt and most have outgrown one. T-shirts are often used as a form of branding, advertising or the making of a statement. 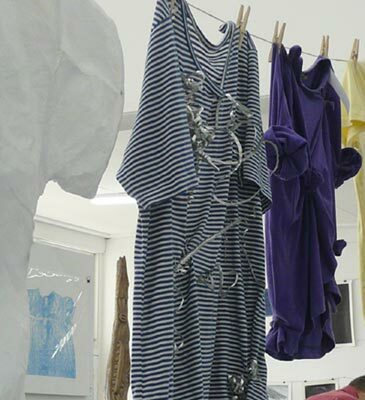 T-shirt as a sculpture, a painting, a poem or as a second chance? 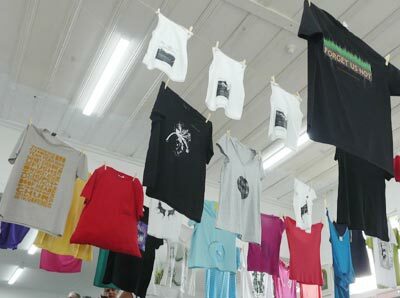 Come view an installation of lines of hanging t-shirts in the newly opened, artist-run space, The Hikurangi Art Station along with a show of prints in the other half of the gallery. Detail of Elephants for Peace by Elaine Arkell, London, U.K. Some artists have responded to the T-shirt as medium such as Elaine Arkell’s “Elephants for Peace” series made for a the Ganesha art exhibition held on the streets on both sides of the border on the island of Cyprus. 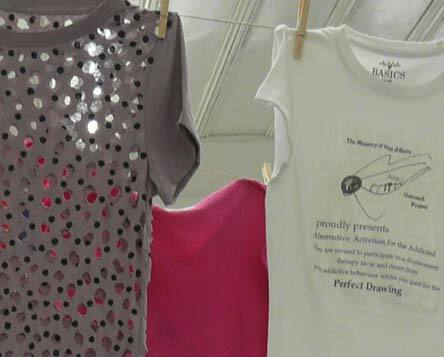 She made these T-shirts in 2011 to be worn by artists involved in performances on the streets. Another submission “Forget Us Not” are the work shirts of Alison and Ursula in their rural Wales gardening business which specializes in garden care for the often forgotten, the elderly. Jason Ratahi’s submission is a statement of intent. Tīmatanga Kaitiaki (Protected or mindful beginning, start or introduction) is a T-shirt of slogans, in Māori and New Zealand English. 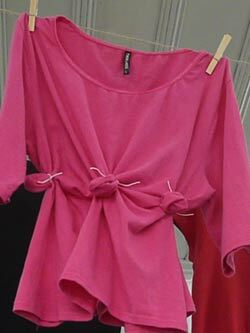 Other artists have taken T-shirts and used them as a medium for re-shaping or re-making. 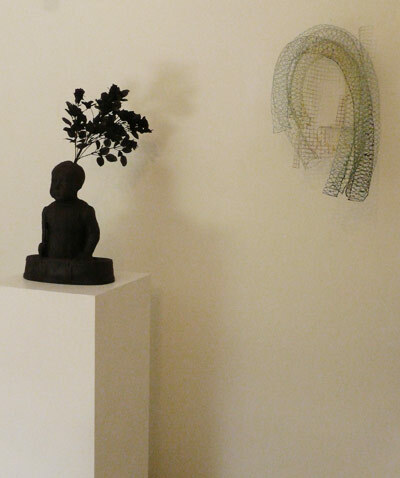 Left to Right: St Cyricus, plastic, artificial flowers and Epoxy, 40 x 15 x 60 cm by Brit Bunkley; Netting, wire and acrylic, by Michelle Backhouse; Pouhine (red basket form), harakeke (flax), muka (flax fibre), commercial dyes. 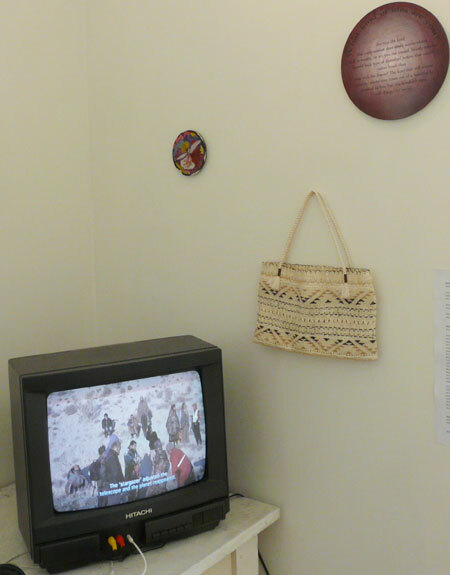 Raranga + whatu (Māori weaving techniques) by Adrienne Spratt; Lake Alice Water-tower, plastic, paint and artificial flowers, 60 x 12 x 12 cm, by Brit Bunkley; Into the pink, wire and acrylic, by Michelle Backhouse; Cleaning the Air, 43 sec video + Daily Dishes, 7 min 11 sec video by Pietertje van Splunter; Oil on canvas by Edward Walton; From the War / No War series, six laser print on card reliefs (obliquely on the wall) by Hohepa; Kete Pingao, 20 x 10 cm, woven basket by Brenda Tuuta; Herenga rahi (Big connections/confinement), harakeke, muka, tanekaha bark and paru dyes. 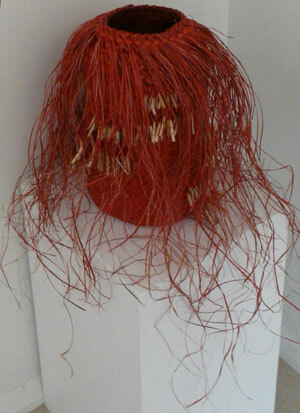 Raranga, whatu (Māori weaving techniques, suspended basket) by Adrienne Spratt. 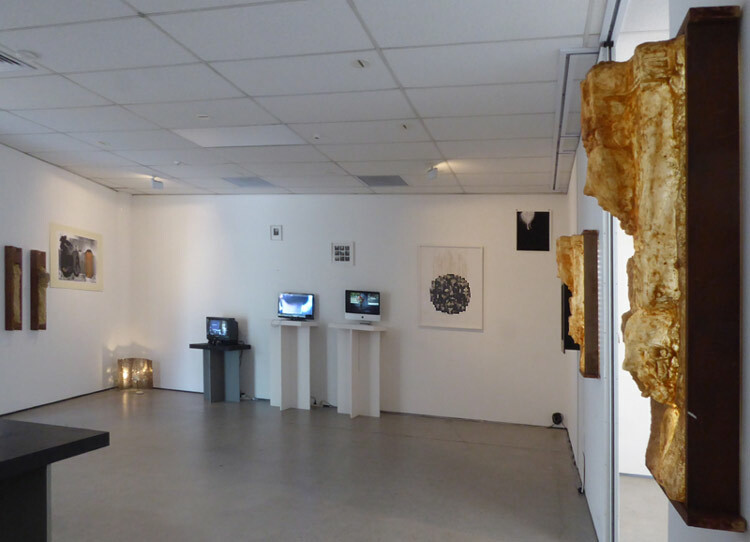 The Poetic Condition was a show of multifaceted visions in diverse media on engaged personal connections with history, culture and social worlds by 13 artists based in the Hague and New Zealand. 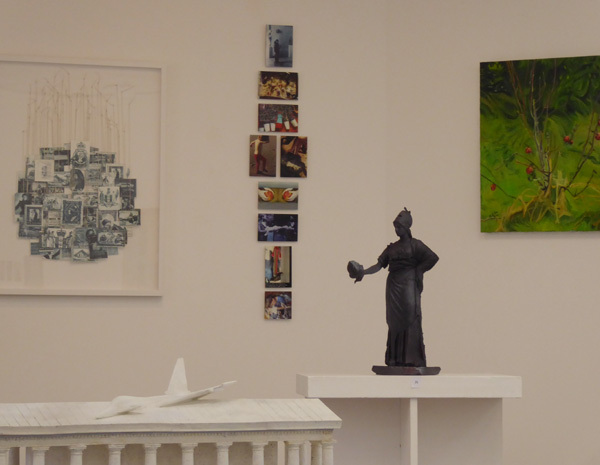 Left to Right: St Cyricus by Brit Bunkley, Netting by Michelle Backhouse. Brit Bunkley’s St Cyricus looks like a doll from a by gone age but is a 3D scan of a 1470-80 marble statue of the child saint by Italian Renaissance sculptor, Francesco Laurana. Bunkley saw this statue in the Los Angeles Getty museum (view this statue) and was intrigued by the idea of a saint being a child. The story goes that in about 200-300 AD, that the child while being held by the governor (while the child’s mother, Saint Julitta, was on trial) the child stated that he was also a Christian and bit the governor. For this act of defiance the child was killed. Other stories tell of him being brutally tortured. The Renaissance artist incorporated symbols of sainthood such as the palm and laurel branches, and the cut off body suggests that he might be in a cauldron. 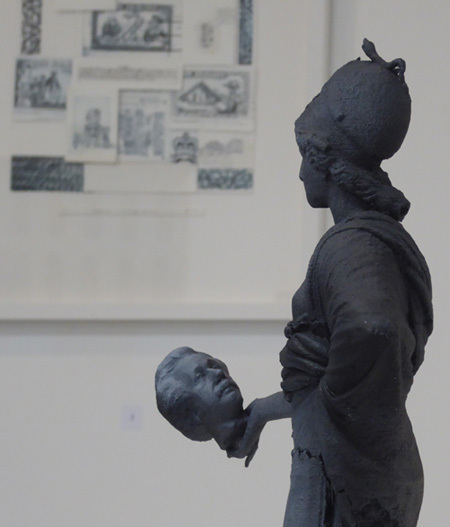 The recasting of this in dark grey plastic with the addition of artificial flowers, makes the work an enigma because both aspects of social history (the religious and the art context of the statue at present) are simultaneously referenced and distanced. 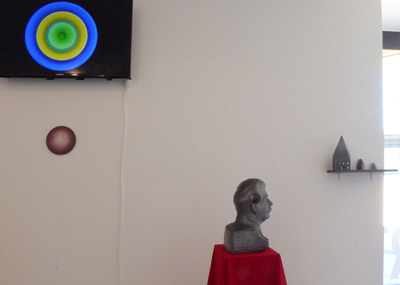 L to R: Een Rode Citroen (A red lemon), 2015, 9 min 53 sec., video + soundscape by Anne Wellmer; Oil on canvas by Edward Walton; Lake Alice Water-tower + St Cyricus by Brit Bunkley. Lake Alice Water-tower, from the abject history series, is another sculpture by Brit Bunkley created with 3D printer from scans of an existing structure also with a flower insert. Perhaps this work is nature vs culture, or nature out of culture. Water towers are still iconic structures in small New Zealand towns. This tower, in particular, makes reference to another aspect of New Zealand’s abject history, the infamous rural pyschiatric institution, Lake Alice. Like many New Zealand psychiatric hospitals, Lake Alice was self-sufficient, with its own farm, workshop, bakery, laundry, and fire station as well as its now questionable practices on its inmates. It closed in 1999. The flower could be a sign that nature always endures, always has some measure of self-sufficency, while the static cultural innate object gains or loses meaning if its function is lost. 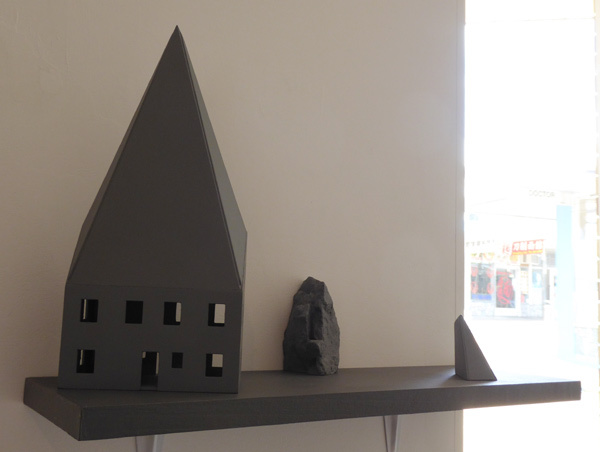 However in foregrounding the materiality of these sculptures, such as details in the greyer than grey facades, he reminds us that this is still artifice, it is still plastic, and in the end this is a sculpture of oppositions that forces us to take our own stance. 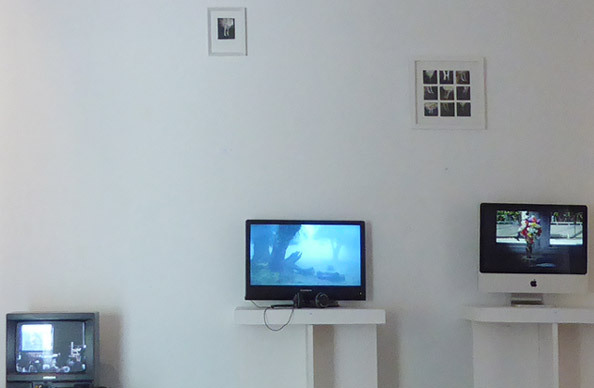 Left to Right: Kāinga a roto (Home Within), suite of 5 videos (on laptop) by Sonja van Kerkhoff, Adumbrate No. 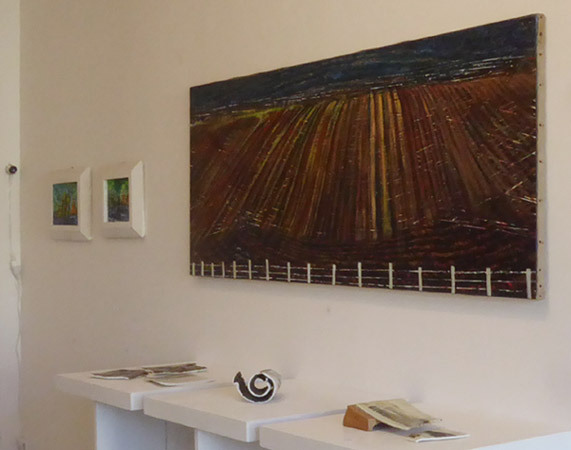 2, 2014, wire netting + Untitled, 2017, wire netting and building paper by Michelle Backhouse; Oil on canvas by Edward Walton; Een Rode Citroen (A red lemon), 2015, animation, 9′ 53” by Anne Wellmer. Soundtrack: Anne Wellmer. Drawings: Geerten Ten Bosch. Animation: Harriët van Reek. Text excerpt from The Writing Notebooks (edited in English by Susan Sellers) by Hélène Cixous. Voice: Stephie Büttrich-Kolman. 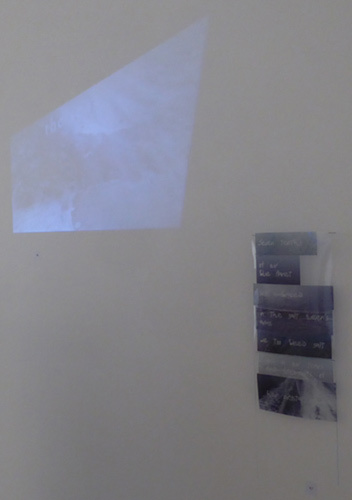 The gallery space was dominated by Anne Wellmer’s soundscapes from her 3 videos played in a loop. Medieval chanting, whisperings in German and English, sounds, narration, instructional or provocative texts connected us with individualistic collaborative worlds. The 9 minute animation Een Rode Citroen (A red lemon), was a surreal exploration of a mutating organic inner and outer ‘strange-scape’ in which eerie sounds and the evocative text (in English) by Jewish-French, Algerian-born poststructuralist feminist, Hélène Cixous complemented biological galatical worlds. Another video Vox Sanguinis (Voice of the blood), was a teaser for the music theater performance by Cora Schmeiser with new compositions inspired by Hildegard of Bingen (1098-1179) by 4 Dutch composers: Giuliano Bracci, Kate Moore, Lukas Simonis, Boudewijn Tarenskeen and Aliona Yurtsevich. The sound design and live electronics were by Anne Wellmer. Vox Sanguinis toured to four cities in the Netherlands in 2015. 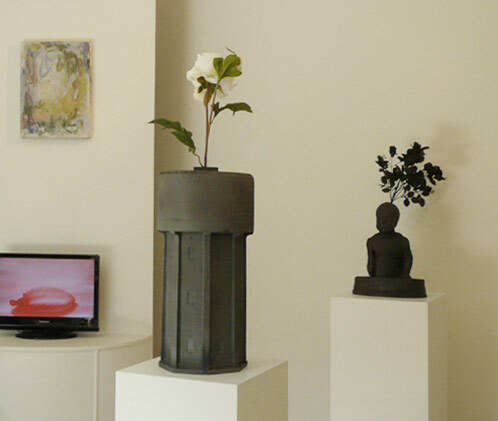 Left to Right: Warm Memories, emulsion on five suspended teabags by Martje Zandboer; The Happiest place on earth, plastic, paint and artifical flowers, 55 x 45 x 10 cm, by Brit Bunkley; Kāinga a roto (Home Within), videos (on laptop) by Sonja van Kerkhoff; Adumbrate No. 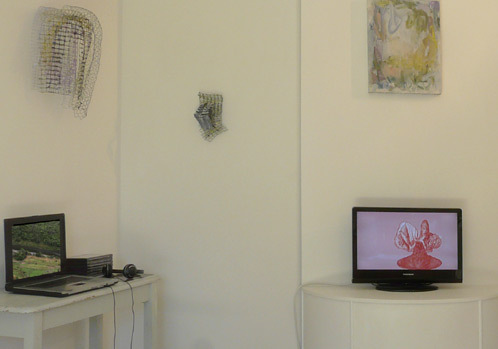 2, 2014, wire netting + Untitled, 2017, wire netting and building paper by Michelle Backhouse; Oil on canvas by Edward Walton; Transfusionen (Transfusions), 2015, video with sound, 2′ 43” by Anne Wellmer. Sound: Anne Wellmer. Hands: Geerten Ten Bosch. Voice: Cora Schmeiser. Music fragment from BLAST (2015) by Lukas Simonis. Text fragment from ‘Della Religione Christiana’ by Marsilio Ficino (1433-1499), first published in Italian in 1568. This German translation was published in ‘Das Blut: Symbolik und Magie’ (Blood: Symbolism and Magic) (2004) by Piero Camporesi; St Cyricus 3D plastic print sculpture by Brit Bunkley. The whisperings in German in the video Transfusionen (Transfusions) spoke of medieval beliefs about witches using the blood of children to make medicine and the various uses (transfusions or transmutations) of this medicine, including the making of wine. 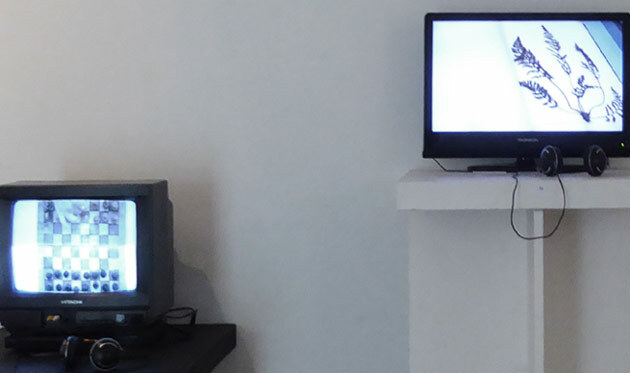 The sounds from these three videos were the soundscape of this show unless one put on headphones to listen to two of the other videos in the exhibition. Under two spatial abstractions of wire by Michelle Backhouse was the suite of videos, Kāinga a roto (Home Within), by Sonja van Kerkhoff (More >>) and around the corner was the 29 minute video, Et in Arcadia Ego by Channa Boon. 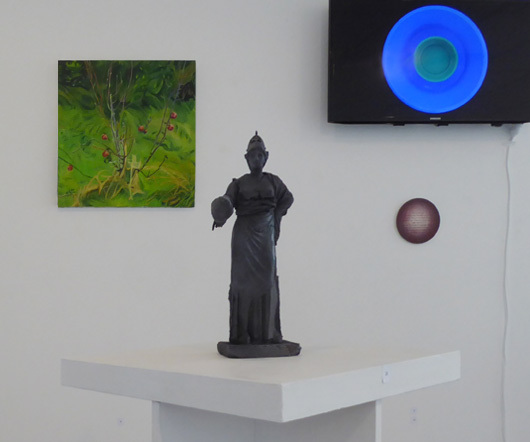 Left to Right: Et in Arcadia Ego, 29 min video by Channa Boon; Love of the other, 10 cm diameter, print on aluminium by Sonja van Kerkhoff; Muka and taniko kete, harakeke muka, tanekaha bark + paru dyes. Whatu and taniko (Māori fibre and weaving techniques) by Adrienne Spratt; What kind of Idea, print on dubond by Sonja van Kerkhoff (More >>). Et in Arcadia Ego was filmed in the former Soviet Union during an artists’ roadtrip. While historical events are the carrier of the film, a chess game, played by two residents of Odessa, sitting near the city’s Arcadia Beach, is the physical link connecting the different locations: the Aral Sea (Uzbekhistan), Odessa (Ukraine) and Tbilisi (Georgia). This film ends when the chess game is over, but the large-scale power game that is still being played out in the former U.S.S.R. is not over. Stalin’s cotton industries for example, founded by him in Central Asia, are still the reason why large parts of the Aral Sea are gone and the entire region is polluted. It has turned out to be the largest environmental disaster of the 20th century. In this work, Boon investigates the idea of location as a carrier of information, which any individual or being can tap into, just by being present at a given spot. Conversely, the film aims to show the system of thoughts and ideas that, throughout history, has created both the physical landscape and those who live in it; how it has affected the way they think and act; and how a collective consciousness has been formed in the past and is still being formed in the present. Virgil’s phrase ‘Et in Arcadia Ego’ is also the title of a famous painting (1638) by Nicolas Poussin. The painting shows a group of shepherds who discover the phrase on a tomb, and so become aware of the existence of death in their Arcadian existence. This gives them the capacity to reflect and thus develop self-awareness. In this video, Boon connects this loss of innocence of the Arcadian shepherd – signifying an ideal world that is destroyed forever – with the present and past of the former Soviet Union. Hence, the phrase becomes a reference to the ideal world that Communism aimed to bring about in this region and the nostalgia that it still invokes. Left to Right: The Happiest place on earth, plastic, paint and artifical flowers by Brit Bunkley; Enclosure No. 1 wire netting + paperpulp by Michelle Backhouse; The Image (The spectacle is mesmeric in order to be successful), silkscreen print and mixed media (More >>) + Where change is barely visible, 2008, laser print by Sonja van Kerkhoff; Kete Whakairo (on table), dyed flax basket by Brenda Tuuta; Et in Arcadia Ego, 29 min video by Channa Boon. The works surrounding this video were a pull and push on this theme of the romantic: Michelle Backhouse’s wire grid in colours that referenced nature and yet were unnatural in a formation that was both plant-like and yet inorganically abstract, woven baskets by Brenda Tuuta and Adrienne Spratt juxtaposed with works bearing politicized texts, and Brit Bunkley’s plastic model of the Disneyland castle recast as a ruin. 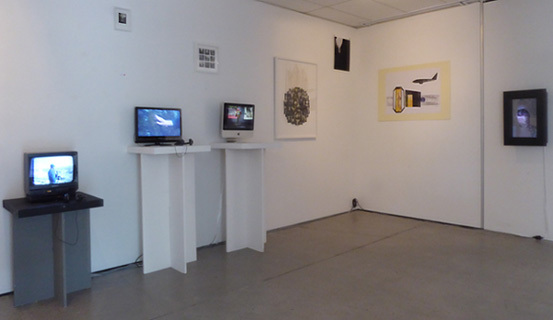 Left to Right: Mauri, harakeke, raranga (Māori weaving techniques) by Adrienne Spratt; Josephine’s Mother, print on aluminium, acrylic and varnish by Sonja van Kerkhoff (More >>); Bird of Prey, mixed media video loop by Sanne Maes; Untitled + Dark Entries, black and white photographs + The Speed of Dark, models on a shelf by Thom Vink; Warm Memories, photographic emulsion on teabags + magnets by Martje Zandboer and The Happiest place on earth, plastic, paint and artifical flowers, 55 x 45 x 10 cm, by Brit Bunkley (More >>). 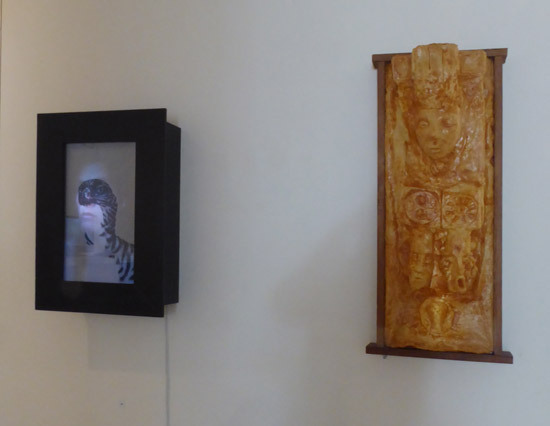 Left to Right: detail of Girl with Iberian Lynx by Michelle Backhouse; Oil on canvas by Edward Walton; From the War / No War series, six laser print on card reliefs, each is 10 x 15 x 2 cm, by Hohepa; Poutama (Step pattern), cylinder shaped basket + Herenga rahi (Big connections/confinement), harakeke, muka, tanekaha bark and paru dyes. Raranga, whatu (Māori weaving techniques) by Adrienne Spratt. Martje Zandboer’s suspended photographic emulsion teabags, Thom Vink’s models and photographs and Sanne Maes’ mixed media video loop develop this pull and push into dialogue between the familiar and the other, estranged or mysterious. 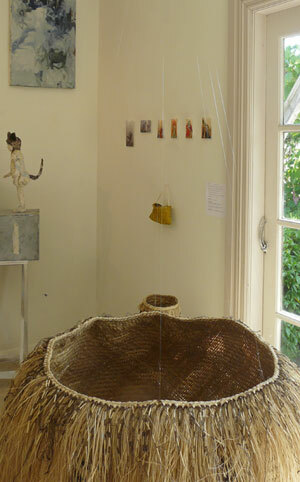 Adrienne Spratt’s basket below, reads as an empty vessel while its title alludes to a spirit filled essence. 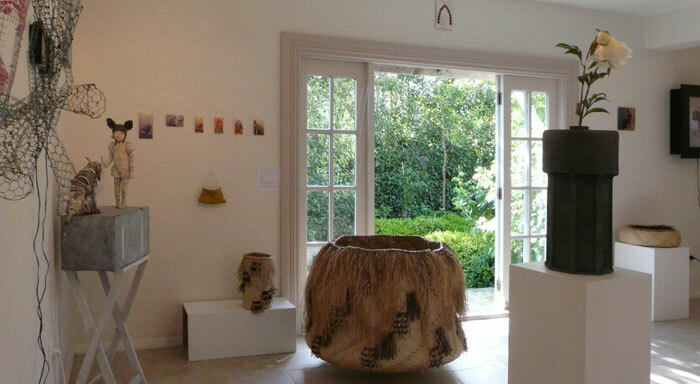 On the other side of the gallery space are two more woven vessels by Adrienne Spratt. The enormous basket sways from numerous lines. Its title refers to both connection and enclosure. Pouhine, Harakeke, muka, commercial dyes. Raranga and whatu techniques by Adrienne Spratt. Edward Walton’s gestural abstract paintings are like signatures or ‘nature traces’ while Michelle Backhouse’s paper pulp, building paper and mixed media, Girl with Iberian Lynx, from the species facing extinction series, references the tangible topic of environmental responsibility. On the adjacent wall a frieze relief of reproductions of paintings from Hohepa’s War / No War series uses Maori cultural symbols as commentary issues of the day. Below this is a small purse-like open pingao (a New Zealand natuve yellow grass) basket by Brenda Tuuta. In another corner lines flow out from the red basket, Pouhine by Adrienne Spratt, which blur its contours. The title refers to the pattern woven into the sides. 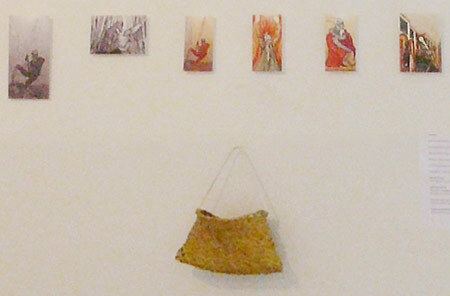 Left ot Right: Detail of Into the Pink, wire and paper pulp + Girl with Iberian Lynx by Michelle Backhouse; From the War / No War series, six laser print on card reliefs, each is 10 x 15 cm, by Hohepa; Kete Pingao, 20 x 10 cm, woven basket by Brenda Tuuta; Poutama (Step pattern), cylinder shaped basket + Herenga rahi (Big connections/confinement), harakeke, muka, tanekaha bark and paru dyes. 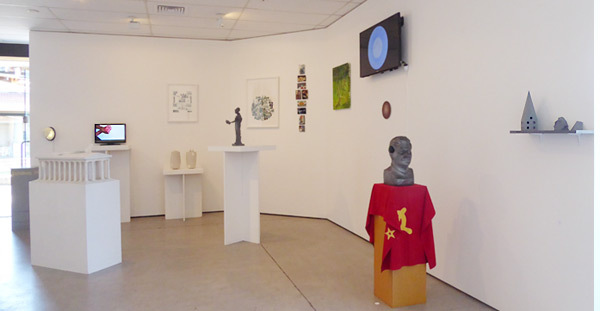 Raranga, whatu (Māori weaving techniques) by Adrienne Spratt, Paewae (Threshold), aluminium print (above doorway) by Sonja van Kerkhoff; Lake Alice Water-tower, plastic sculpture by Brit Bunkley; Josephine’s Mother, print on aluminium, acrylic and varnish by Sonja van Kerkhoff; Mauri (essence/spirit), harakeke, raranga (Māori weaving techniques) by Adrienne Spratt; Detail of Bird of Prey, mixed media video loop by Sanne Maes. Left to Right: From the War / No War series: Warrior with Taiaha, Patu-paiarehe lovers, black and white laser prints on card, Warrior with Taiaha, Mākutu, No more war with Taiaha laid down, Rangatahi, colour laser prints on card, each piece approx. 10 x 15 x 2 cm, by Hohepa; Kete Pingao, 20 x 10 cm, woven basket by Brenda Tuuta. The heart of Hohepa’s work is a dialectical process – fed from his Māori heritage. He descends from the tribes: Ngāti Whakaue, Tuhourangi, Tuwharetoa ki te Aupouri, Tapu Ika, Rangitihi, Uenukukopako, Te Arawa, Ngāpuhi (Whangaroa), Ngāti Kai Tangata. 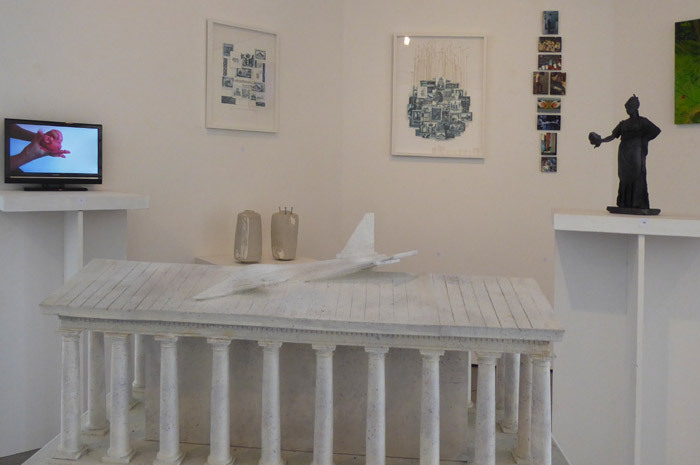 These small reliefs are prints of 1 x 2 metre paintings from the War / No War series exhibited in 2017 in the Chiesa San Antonio, Lecce, a Baroque church in southern Italy. 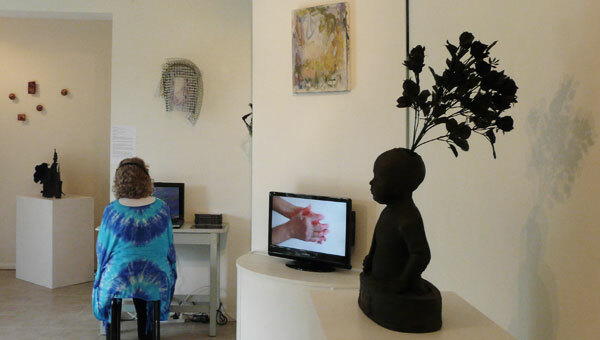 Left to Right: Into the pink, wire and acrylic, by Michelle Backhouse; Detail: Lake Alice Water-tower, plastic, paint and artificial flowers by Brit Bunkley; Cleaning the Air, 43 sec video + Daily Dishes, 7 min 11 sec video by Pietertje van Splunter. The video Cleaning the Air is actually a recording of a mobile sculpture which animates various household cleaning objects while in the video, Daily Dishes, the mundane chore of doing the dishes is turned into an animation of colour and pattern. Still from Cleaning the Air by Pietertje van Splunter. 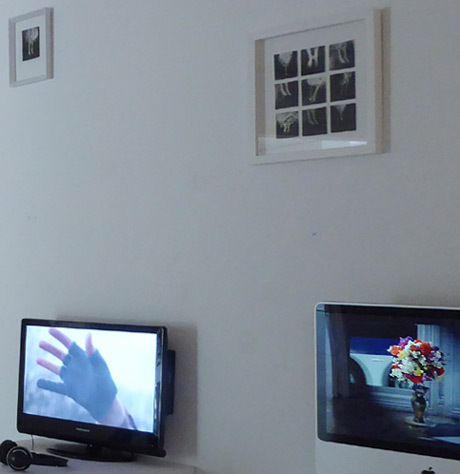 Pietertje van Splunter’s videos are like a poetics on the mundane: housework. Her brooms seem animated by an unearthly force and the constant stacking of the differing tribes of kitchen utensils suggests a game with secret rules. 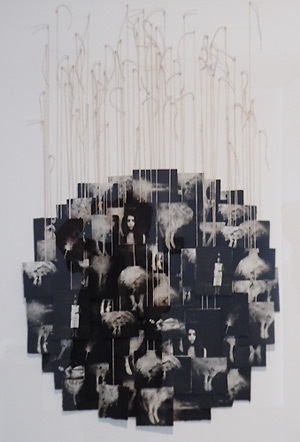 In using humour with the overkill her videos are reminders that the everyday domestic, is also a microcosm of the amusing, perhaps necessary banality of habit while Michelle Backhouse’s sculptures use seemingly banal materials, building paper, netting or house paint to create ethereal protusions.